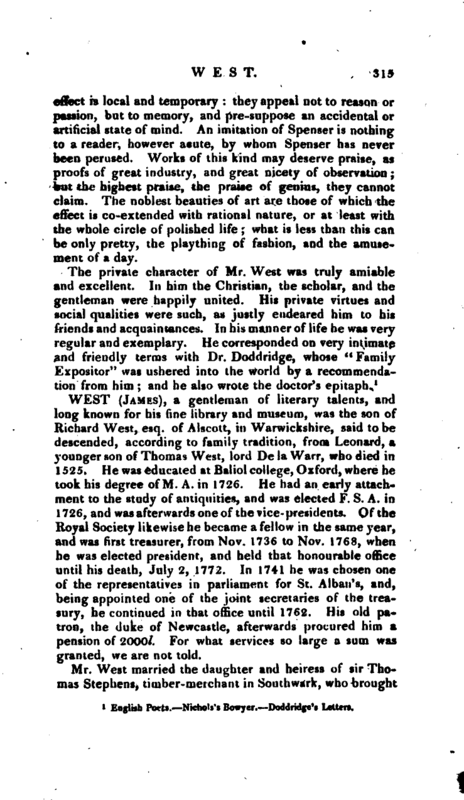 , a gentleman of literary talents, and long known for his fine library and museum, was the son of Richard West, esq. of Alscott, in Warwickshire, said to be descended, according to family tradition, frona Leonard, a younger son of Thomas West, lord De la Warr, who died in 1525. He was educated at Baliol college, Oxford, where he took his degree of M. A. in 1726. He had an early attachment to the study of antiquities, and was elected F. S. A. in 1726, and was afterwards one of the vice-presidents. Of the Royal Society likewise he became a fellow in the same year, and was first treasurer, from Nov. 1736 to Nov. 1768, when he was elected president, and held that honourable office until his death, July 2, 1772. In 1741 he was chosen one of the representatives in parliament for St. Alban’s, and, being appointed one of the joint secretaries of the treasury, he continued in that office until 1762. His old patron, the duke of Newcastle, afterwards procured him a pension of 2000l. For what services so large a sum was granted, we are not told. Nichols’s Bowyer. Restitua, vol. 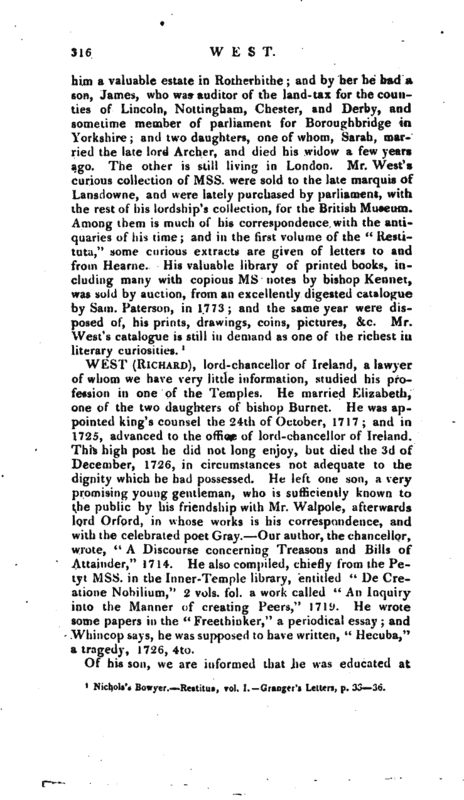 I. Granger’s Letters, p. 3336.